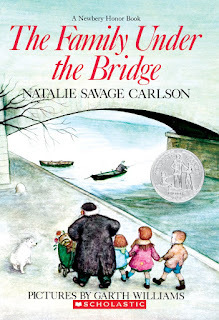 For MMGM, I am recommending The Family Under the Bridge by Natalie Savage Carlson. This extremely short (about 130 pages) Newbery Honor book, which was first published all the way back in 1958, tells the story of a homeless man named Armand who is perfectly content with his life, in which he has given up responsibility and is free to do what he wants. However, Armand then finds a homeless single mother and her three children living under the bridge in Paris that he also lives under. He initially dislikes this family but later begins to bond with the children and take care of them while their mother works. Armand ends up trying to help the children and their mother find a home after realizing that having some responsibility in life can be worth it. This novel is fun to read, with Armand and the children's adventures helping to maintain an upbeat tone. The book's short length also works to make the book a breeze to move through! However, The Family Under the Bridge also tells an important story that can teach young children to have empathy for the homeless and not blame them for their plight, making it a valuable book that I wholeheartedly encourage everyone to read! Since school's started back up, I have very little time to write this post, so I'll keep it short! For MMGM, I am recommending The Wednesday Wars by Gary D. Schmidt. Gary D. Schmidt offers an unforgettable antihero in The Wednesday Wars — a wonderfully witty and compelling novel about a teenage boy's mishaps and adventures over the course of the 1967-68 school year. Meet Holling Hoodhood, a seventh-grader at Camillo Junior High, who must spend Wednesday afternoons with his teacher, Mrs. Baker, while the rest of the class has religious instruction. Mrs. Baker doesn't like Holling — he's sure of it. Why else would she make him read the plays of William Shakespeare outside class? But everyone has bigger things to worry about, like Vietnam. His father wants Holling and his sister to be on their best behavior: the success of his business depends on it. But how can Holling stay out of trouble when he has so much to contend with? A bully demanding cream puffs; angry rats; and a baseball hero signing autographs the very same night Holling has to appear in a play in yellow tights. As fate sneaks up on him again and again, Holling finds Motivation — the Big M — in the most unexpected places and musters up the courage to embrace his destiny, in spite of himself. I read this book when I was in eighth grade, and I recall that, not only did I enjoy the novel, but so did the rest of my class! 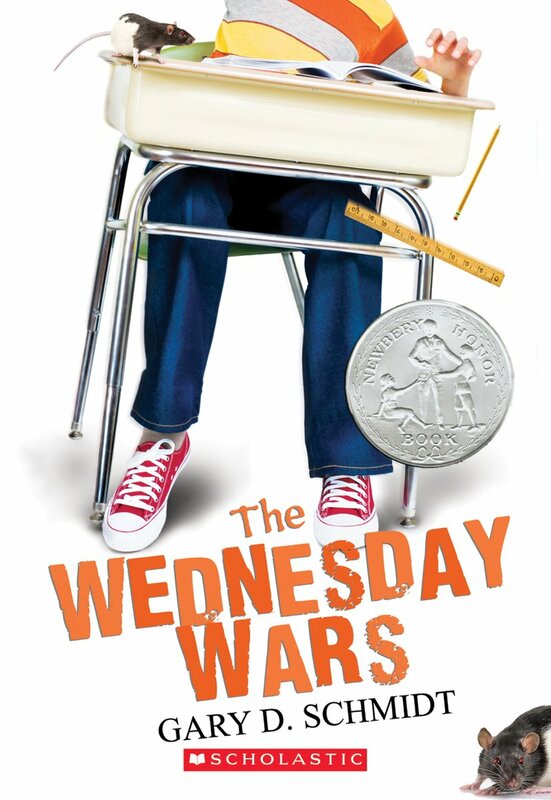 The Wednesday Wars takes place over the course of a single school year and chronicles narrator and protagonist Holling's experiences and mishaps. Instead of having a plot to move things along, the novel instead features many smaller storylines that discuss, amongst other things, Holling's selfish father and other family, his relationship with his teacher, or random events such as dealing with classmates or performing in plays. One of the best parts of the novel is how true it is to the era it is set in. The Vietnam War takes teachers' spouses to Vietnam, sends refugees to the school, and even prompts characters to join the anti-war movement or become hippies. The book also mentions current events relating to politics or civil rights, helping to make the book an interesting look into another time. Despite these topics, The Wednesday Wars still manages to be absolutely hilarious at times, such as when describing Holling's exaggerated struggles or other random occurrences (such as the "angry rats" mentioned in the publisher's description). 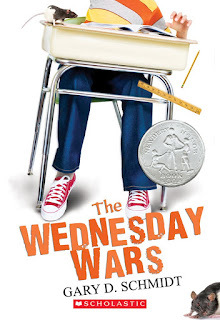 The Wednesday Wars's combination of interesting plot events, hilarity, and important topics makes it a book that absolutely everyone should read! 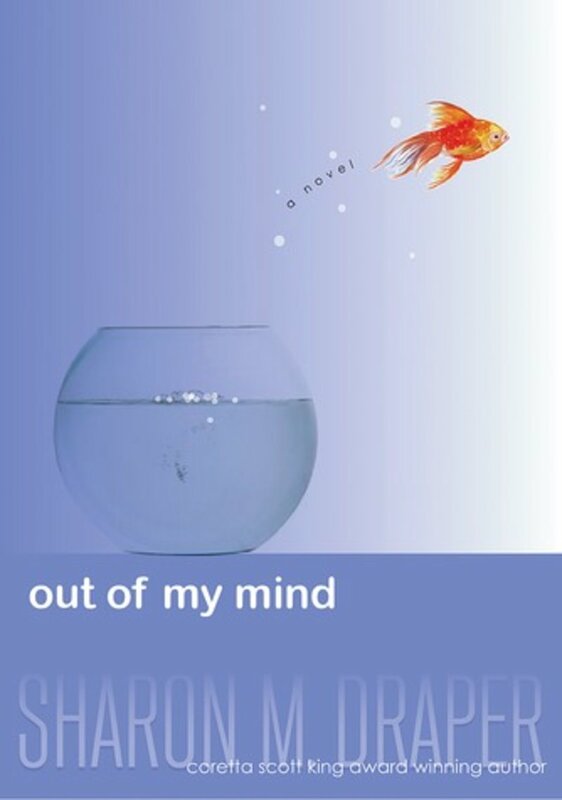 For MMGM, I am recommending Out of My Mind by Sharon M. Draper. I haven't read a book as touching and perspective-altering yet not relentlessly upsetting as Out of My Mind in a long time! The novel revolves around fifth-grader Melody Brooks, who is a genius with a photographic memory. There's just one problem: she has cerebral palsy, which makes it impossible for her to speak (she can just barely even move her hands) and traps all of her racing thoughts inside of her. Melody is particularly observant (as anyone would be if they couldn't talk) and appreciates the good parts of her life, such as her loving parents who help her with tasks as simple for others as eating and using the bathroom, her young and physically able sister Penny, and her neighbor Violet Valencia, or Mrs. V, who often takes care of her during the day, teaches her information in addition to that which she learns at school, and pushes her to succeed and not dwell in unhappiness. When Melody's special-needs class is integrated with several other classes and she gets a machine to help her talk for the first time, Melody enters the world of making friends and even participating on her school's quiz team while dealing with people's perceptions of her. Unlike many books, which are usually filled with dialogue between characters, Out of My Mind, especially before Melody gets her talking machine, is filled with Melody's own thoughts about her life. She realistically points out both the lovely and heartbreaking parts of her life, and author Sharon M. Draper makes sure to add in plenty of beautiful figurative language and vivid imagery. I also adored how richly developed every character's personality and history was, even with side characters such as Melody's special-needs or non-special-needs classmates. The ending of Out of My Mind will both break your heart and put it back together (hint: when you finish the book, flip to the beginning! ), making the entire journey worth it. If you haven't read Out of My Mind, you're missing out on a book that introduces a new perspective, draws you back in again and again, and makes sure to make your heart hurt at times, but ultimately swell and grow! 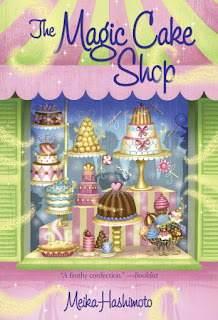 For MMGM, I am recommending The Magic Cake Shop by Meika Hashimoto, with illustrations by Josée Masse. Not every book is a life-changing epitome of writing, with perfect characters and a perfect plot. 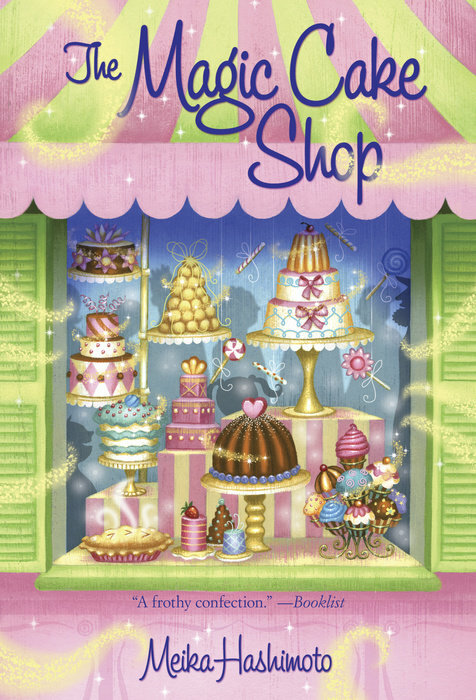 The Magic Cake Shop is a bit silly, a bit ridiculous, and a bit immature (it might be best for older elementary schoolers or younger MG readers). However, if you take The Magic Cake Shop for what it is, which is a fun, extravagant ride of a novel that will appeal to your inner kid, it ends up being a delightful read that is worth the time! The Magic Cake Shop revolves around a girl named Emma who lives with two wealthy parents. Her parents are certainly not characters readers are supposed to sympathize with, being constantly obsessed with their appearances and Emma's (wanting her to get plastic surgery, for instance, or eat barely anything in order to stay thin). They send Emma to live with her exaggeratedly filthy, mean, and selfish uncle, Simon, for the summer, with her main source of solace being a nearby world-renowned bakery run by a man named Mr. Crackle. When a friend of Emma's uncle poisons the baker in order to force him to make a complex elixir, Emma helps Mr. Crackle gather ingredients and prepare the potion, learning about magic ingredients and stories about them in the process. One part of the book that I loved was just how exaggeratedly evil the villains of the story are. In a world where almost all books explore the motives and facets of every character, it is refreshingly fun to see how Emma sidesteps the almost-ridiculous levels of unpleasantness that these characters force on her. Author Meika Hashimoto also does a great job at thinking up the supernatural ingredients that Mr. Crackle uses to make desserts and the elixir, which range from gusts of wind and light from the Northern Lights to strange jumping blobs and magical berries (their Seussian names do get annoying after a while, though). What might be considered flaws of The Magic Cake Shop (its undeveloped antagonists and slight immaturity in general) I think readers will consider, as I did, part of the charm of the novel, which will be enjoyed by anyone who is a child at heart! P.S. On Wednesday, Completely Full Bookshelf will become two years old!!! I want to thank to MMGM show runner Greg Pattridge (and his predecessor, Shannon Messenger) for helping my posts reach a broader audience, as well as my readers, for making sure that writing all of these posts has been worth it. I can't wait to see what this next year brings!